In 2008, while traveling with family and friends through northern California’s wine regions, we were introduced to a new decanting funnel device in some of our favorite winery’s tasting rooms. Intrigued, we were given the pitch of how this new device accelerated the traditional decanting process to reduce the time required to achieve an optimal tasting experience of the wine. 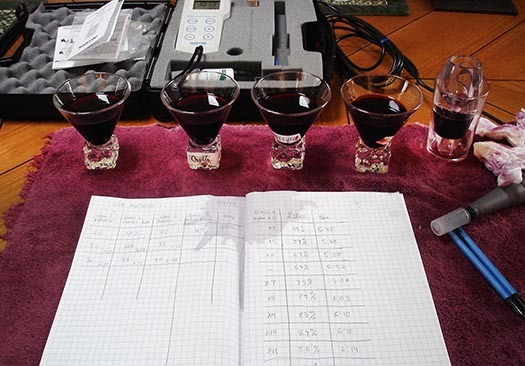 Years later, the public is now becoming more educated on the benefits of aerating wine. Since the introduction of that product and many available alternatives on the market, aeration is now not only in the lexicon of experienced wine connoisseurs, but also in that of most casual wine drinkers as well. Further, a quick search on the web delivers a number of self-proclaimed experts espousing the glorious benefits of the aeration process in the most subjective terms. “Okay, but wait,” I have a degree in applied physics and am a bit skeptical of pseudo-science. “Where’s the data”? was in the back of my mind as I returned from this tasting trip with my friends and family. Oh yes, of course, also with one of the funnel devices in hand! Over the next year or so of trying to convince myself that this device made my wine taste better, my science background was always gnawing at me - I needed quantitative data. “How can I quantify this device”? Answer: Set up the lab. I ended up spending more than I typically do on a fine case of wine and purchased a scientific instrument – a Milwaukee Dissolved Oxygen Meter. Well, my wife and kids looked at me a little funny when I set up the lab on our dining room table, and in early 2010 began measuring just what the funnel device did. I began measuring the O2 content dissolved in a glass poured through the funnel device compared to a glass that was poured directly from a freshly uncorked bottle. Measurements were recorded immediately as well as over time. Suffice it to say, there was a small increase in O2 in the funnel device glass as compared to the control glass, but comparatively, with an insignificant amount. The gears began turning. I immediately began experimenting using concentrated oxygen and various delivery methods to increase the O2 content dissolved in the wine. 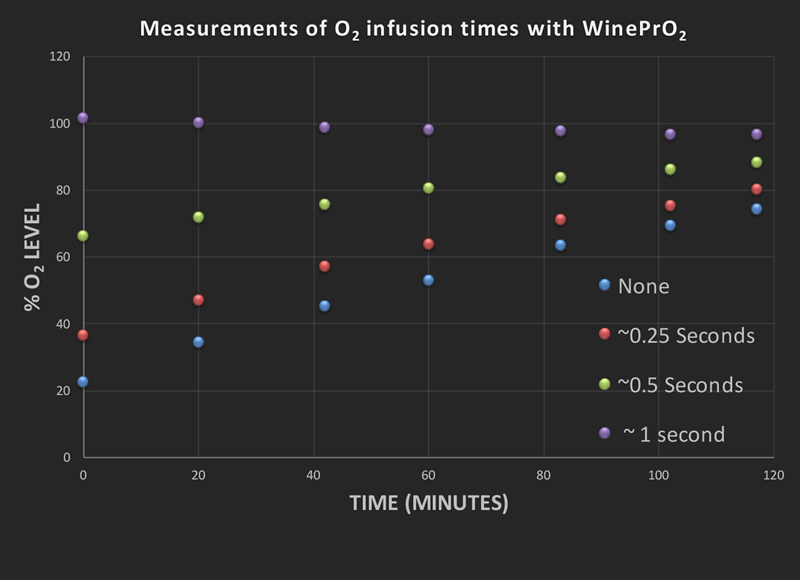 After blowing wine all over my “lab”, I eventually developed a nozzle and dispensing system to allow a controllable way to adjust the O2 content in the wine from a small amount up to a super-saturated state (above 100% concentration) and anywhere in between depending on the exposure time. Okay, now I have my data. Patent filed in 2010. The path to the WinePrO2™ device has begun. My intention with introducing this product is to allow the user to determine what the optimal level of decanting is to tailor it to their specific tastes. Also, no subjectivity. Results are measureable! Since these first measurements in 2010, I have continued to purchase and measure the results of various devices as they are introduced in the market with the usual subjective descriptions and no supporting data. Some I have measured introduce a little more or even less O2 than the funnel device. None have been capable of offering as much as a traditionally decanted wine at the three hour point. 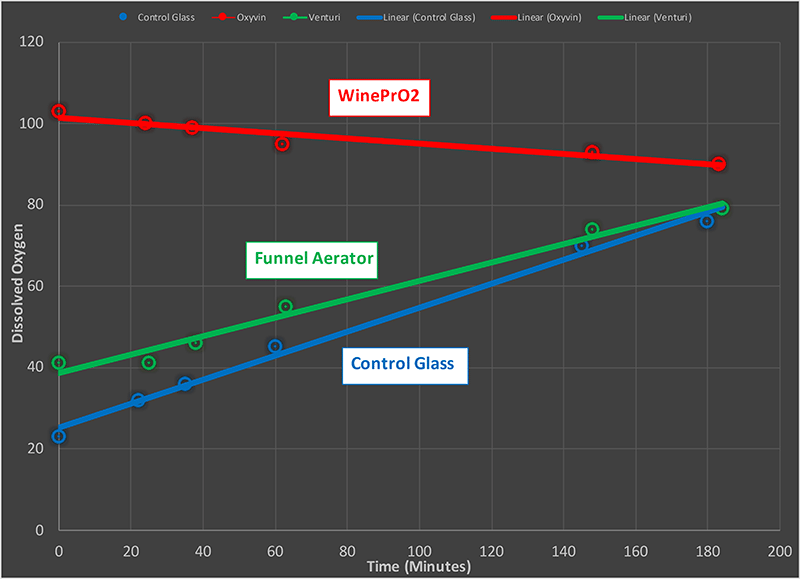 The WinePrO2™offers this capability as well as more or less, all at the control of the user. Decanting is a process which increases the dissolved oxygen content in a wine. The various forms of aerators that introduce air into the wine pouring process are limited since air contains only 21% oxygen. The fastest, most efficient and controllable decanting method is to deliver 100% oxygen into the wine in the decanting process. 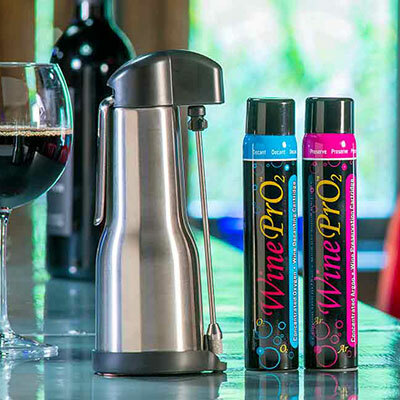 The WinePrO2™device provides just that and allows the user to control the amount required to obtain the optimal taste. Experiment and enjoy!